I didn’t have a muffin until I was a teenager. My Filipina mother had no idea what a muffin was at the time but somehow we finally managed to get her to buy some Lemon Poppy Seed Muffins from the bakery in the commissary. Please believe my sisters, brother and I demolished that package in 2 seconds flat. I barely remember the flavor only that it was good and sweet. I had forgotten about this recipe but I’m so glad I was able to piece it together again. The flavor and texture remind me of that first time all over again. This paleo muffin is so moist with the perfect hint of sweet and lemon. I ate three and thankfully my son and husband polished off the rest. You can bake this directly in your muffin tin. To do this simply grease the pan well and reduce the cooking time by 5 minutes. In a small bowl combine the coconut flour, baking soda and poppy seeds. In a small pan on your stove top, melt the coconut oil. Next add in the lemon juice and rind and keep warm for 1 minute to help release the oils from the rind. Then add in the vanilla and honey and let cool. Lastly add the milk and eggs to the liquid mixture and combine with the dry ingredients. Pour the batter into muffins tins and bake at 325 for 20 - 25 mnutes. Oh my word, they look like they need to ALL be in my belly! I love anything with lemon! I love muffins! And these look delicious! 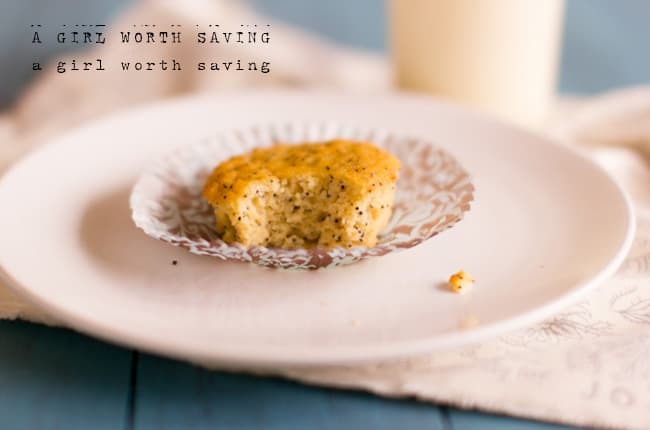 I was probably in high school when I had a muffin–my mom never made them and certainly would not have purchased anything prepackaged! Your Paleo Muffins look fabulous, momma! Aw, thanks! My mom had no problem with packaged food, lol, but she just did not every buy muffins nor make them until we were older. YUM! I love love love lemon poppyseed muffins. They’re like a little bit of sunshine in the morning. I’m gonna make these soon! I love that there’s not ten different flour substitutes in this. Makes it more doable! Maybe I’ll try paleo baking again one day. Ooh, lemon & poppy seed sound so yummy together! It sounds like a great combo, I actually love poppy seeds but I never thought of them for anything buy bagels, lol. These look good. They would be great for snacks. 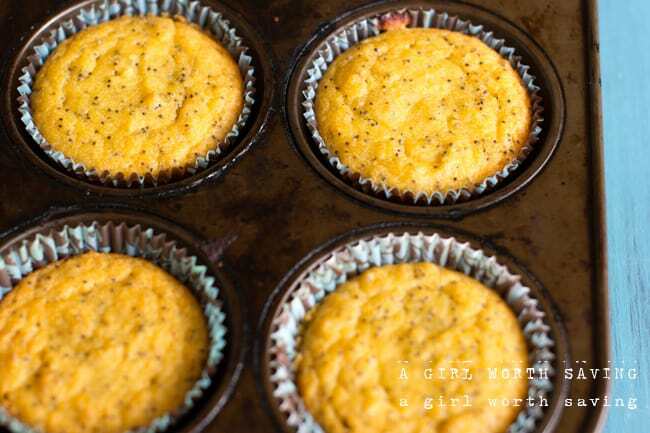 Yum, I love the way poppy seeds look in muffins. Yum, those look delicious! 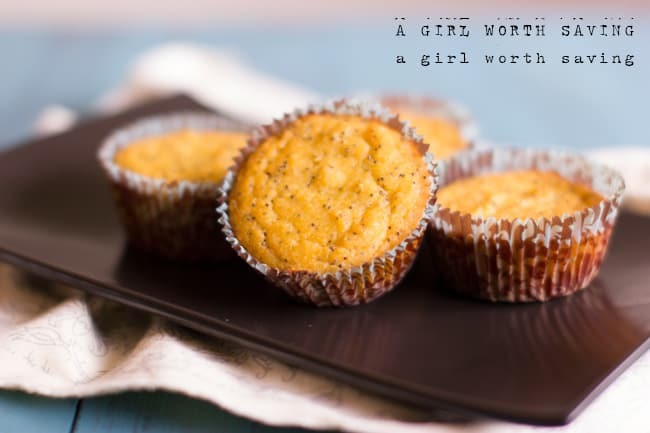 I actually really love lemon poppy seed muffins – and bread too! Those look perfect. Hard to believe their paleo. I think I’ll be trying this recipe. Yum! Delicious and fluffy! I made these but messed up with the coconut oil and it hardened in chunks when i added eggs (I’ll probably leave the eggs and milk out so they get up to room temp next time) so I threw all the liquids into the blender for two minutes and it all worked out, and perhaps made them even fluffier! Rating this five stars, it deserves it. Excellent recipe. Thanks Dana 🙂 It’s one of my favorite recipes. Awesome 🙂 Your hats are cute too! All I have on hand is full fat coconut milk in a can. Do I need to water it down? Thank you! I used the coconut milk. The muffins are very attractive. They are kind of wet on the inside but I’m used to that when baking with coconut flour. I knew with only 1/4 cup honey they wouldn’t be too sweet (that’s what I liked about the recipe) but they had a bitter taste to them. =( I don’t know if I had a bad lemon or what but I’m disappointed. What do you think I did wrong? Hrmm. . . bitter? It may have been the lemon or goodness, I don’t know maybe the coconut milk. Does the brand you use have any additives in it? Maybe there was a strange reaction? I’ll add this to my list of tutorial videos. I will admit I am new to Paleo baking and have tried Paleo muffins that call for coconut flour, with MORE than disappointing results. 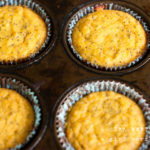 I have not tried these beauties yet, but they look VERY MUCH like wheat flour based lemon poppyseed muffins, so flully with a great crumb! Thanks Jennie. I do use tapioca flour but, hrmm .. I can’t think of an easy way to break down baking with it. I have not tried it in muffins yet but I do have a cinnamon roll recipes that is fantastic made with it and coconut flour. Sorry that doesn’t help! I just disabled my mailing list sign up on mobile devices so you shouldn’t have this issue anymore. Sorry hun! do these muffins freeze & reheat well? what about the paleo southern bisquits do they freeze & reheat well ? Are these muffins freezable & would they defrost well ? Yeah! So glad you loved it Lindsay! So glad you enjoy them Sunny! Keep us posted, Lindsay. Let us know your recipe for the icing, please! Can I substitute chia seeds for poppy seeds?